The research organization DAKSH recently released the results of its Access to Justice survey in National Law University, Delhi. The study was undertaken in a bid to understand the barriers that litigants face in accessing the courts and justice in India. One interesting fact which came out was 38 percent of the litigants believe that the judges are to blamed for the poor accessibility system in India. Ah. This fact brought back a lot of memories. It reminded me of the period of 2014, when I started researching on the problem of pendency of cases in India. Well, we do have the largest backlog of cases in the whole world. The number of pending cases are more than 3.2 crore and it is supposed to reach 15 crore by the end of year 2019. According to Delhi High Court, it will take us more than 464 years to clear this backlog. Then they have these holidays. For example, the Supreme Court has 193 working days, HCs 210 days and trial courts 245 days a year. Our former CJI , R. M Lodha, took note of the situation. 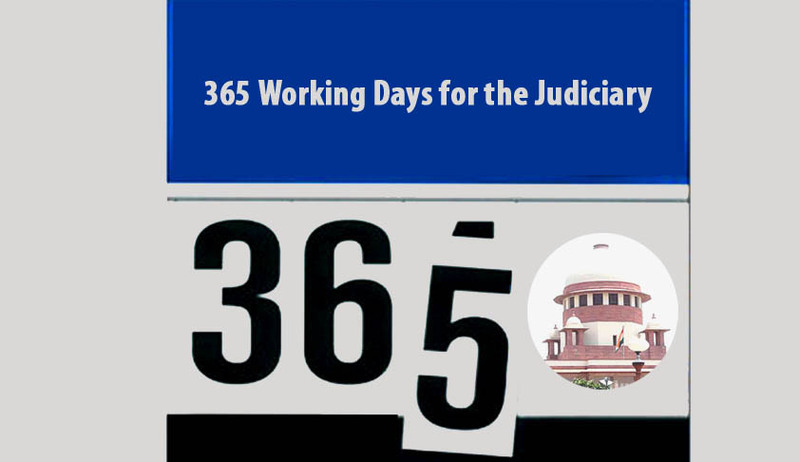 In a bid to wipe out pendency and give relief to litigants, he suggested to Chief Justices of High Courts that courts function all 365 days a year. Just like any other organized workforce in India, the idea was to make judges work in shifts. I remember that this recommendation came out in 2014 Summer, when I was interning at HRLN, Delhi. I was really happy. This made so much sense to me. Also, within a month, the Bar Association rejected this recommendation calling it impractical. WHAT? This was just ridiculous! How can you have winter vacations, summer vacations, durga pooja break etc. when we already have such a huge burden on our hands? I took this responsibility on myself. So do we actually know the real scenario? 30 years ago, a recommendation was made by Law Commission of India to increase the number of judges from the then 10 judges per 10 lakh people to 50. Coming to 2016, the judge-to-people ratio stands at 17 judges to 10 lakh people, which is way lower as compared to other countries such as US, Australia, UK and Canada. This number hasn’t really changed much and it is one third of the required limit. By the way, from 1987 till now, we have added 25 crore in terms of population. The primary reason for the non-appointment of judges has been the constant tug of war going between the Centre and the states over funding, infrastructure and other issues. While this tug of war keeps going on, what remains constant is the judge strength and pending cases. Is it fair to put the whole burden on the judiciary only? Two months back we saw the Chief Justice of India breaking down over this huge backlog of cases. It actually took him all of 37 minutes and four seconds to force the nation to sit up and pay attention. This rounds up to the same time in which judges around the country complete 15 hearings and decide seven cases, on average. Wondering how fast our judges are? According to the statistics revealed by Daksh ‘Access to Justice’ Survey, judges in the busiest courts of India spend an average of 2.5 minutes to hear a case and about five minutes to decide one. Not because our judges are in a hurry. But because they hardly have time to dedicate to a case, such is the shortfall of judges in the country. Now don’t you think that there will be a compromise on the quality of justice, if we keep pressurizing the judges with speedy resolution of disputes? According to the report published in the Lok Sabha on March 3, 2016, 44 per cent judges are missing in high courts, 25 per cent in subordinate courts and 19 per cent in the Supreme Court. When citizens are suffering because of the huge delays in the judicial system, there can be no justification for such high levels of sanctioned positions being vacant. Now, this is actually ridiculous. It is not enough to criticise, and shift the entire burden to the judiciary. If we compare performances of Indian judges to the other countries, we are head and shoulder above them. According to the statistics revealed by National Judicial Data Grid (NJDG), from a Munsif to a Supreme Court judge, the average disposal in India is 2,600 cases per annum as compared to 81 cases per annum in the US. 2,600 cases as compared to 81 cases per annum? This is 32 times better performance than the US courts! I, myself, am aware of judges in the Kolkata High Court who resolve 100 matters in one day. How can you expect judges to work in shifts as a part of 365 work day policy when we do not have enough judges at the first place? Even during court vacations, the vacation bench is always present to hear matters. There is never a full closure of courts anywhere in the country. Also, there is a functional system of night courts for hearing matters which are taken up after the evening hours. We have 24 hours availability of Metropolitan Magistrates to hear emergency cases if the matter is brought to his house on a holiday or during vacations. And we still blame the judges? Maybe, it is the easier option? I am not denying that there will be some corrupt judges as well but that is not enough to draw a hasty generalization for the whole scenario. Judges in India are working really hard and they are under immense pressure. We need to understand the plight of our judiciary. We need to look beyond and see the other perspective. We need to appoint more judges. We need to promote the usage of Alternative Dispute Resolution (ADR) mechanisms. We need to make use of Information and Communication (ICT) technology to deal with the accessibility aspect of our justice system. We need more innovative solutions. We need to stop blaming the judges. I did it once. And I still regret it.